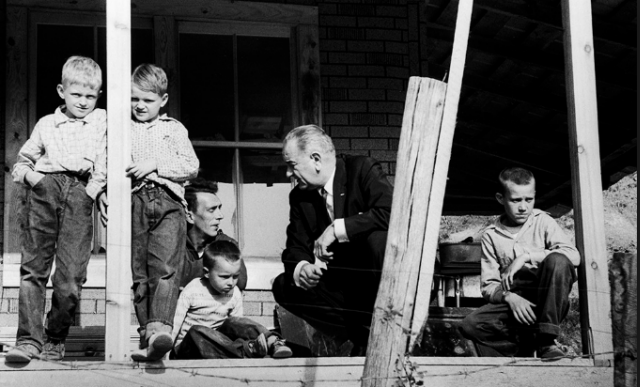 President Lyndon Johnson’s visit to Tom Fletcher’s home in Kentucky was part of his tour of poverty stricken areas in the U.S. (Photo by Walter Bennett/Time & Life Pictures/Getty Images). Fifty years ago, President Lyndon Johnson used his first State of the Union address to urge “all-out war on human poverty and unemployment in these United States.” The War on Poverty, as the set of social programs enacted in 1964-1965 came to be called, was arguably the most ambitious domestic policy initiative since the Great Depression. But for decades, politicians and social scientists have argued about whether Johnson’s antipoverty programs have lifted people out of destitution, trapped them in cycles of dependency, or both. Critics note that the official poverty rate, as calculated by the Census Bureau, has fallen only modestly, from 19% in 1964 to 15% in 2012 (the most recent year available). But other analysts, citing shortcomings in the official poverty measure, focus on a supplemental measure (also produced by the Census Bureau) to argue that more progress has been made. A team of researchers from Columbia University, for example, calculated an “anchored” supplemental measure — essentially the 2012 measure carried back through time and adjusted for historical inflation — and found that it fell from about 26% in 1967 to 16% in 2012. 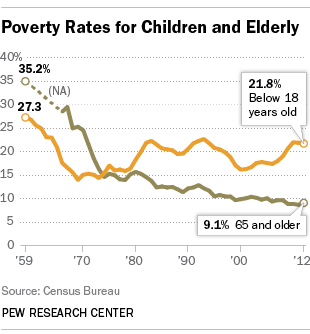 Far fewer elderly are poor: In 1966, 28.5% of Americans ages 65 and over were poor; by 2012 just 9.1% were. There were 1.2 million fewer elderly poor in 2012 than in 1966, despite the doubling of the total elderly population. Researchers generally credit this steep drop to Social Security, particularly the expansion and inflation-indexing of benefits during the 1970s. Today’s poor families are structured differently: In 1973, the first year for which data are available, more than half (51.4%) of poor families were headed by a married couple; 45.4% were headed by women. In 2012, just over half (50.3%) of poor families were female-headed, while 38.9% were headed by married couples. Poverty among blacks has fallen sharply: In 1966, two years after Johnson’s speech, four-in-ten (41.8%) of African-Americans were poor; blacks constituted nearly a third (31.1%) of all poor Americans. By 2012, poverty among African-Americans had fallen to 27.2% — still more than double the rate among whites (12.7%, 1.4 percentage points higher than in 1966). But poverty has risen among Hispanics. Poverty data for Hispanics, who can be of any race, wasn’t collected until 1972. That year, 22.8% lived below the poverty threshold. In 2012, the share of Hispanics in poverty had risen to 25.6%. But the U.S. Hispanic population has quintupled over that time. As a result, more than half of the 22 million-person increase in official poverty between 1972 and 2012 was among Hispanics.